The Prowler 830 Remote Control provides the ultimate in automatic pool cleaning convenience. It's the computer-controlled, programmed cleaner that scrubs and vacuums pools bottom, walls and steps and provides supplemental filtration of pool water. The wireless radio remote control system provides two automatic cleaning options, one for the pool bottom and a second for the bottom and sides. Remote control functions allow for overriding the automatic cleaning modes to perform quick spot clean-ups. Simply guide the cleaner to any area of the pool with the touch of a button. It requires no installation, no booster pump, and no hoses. 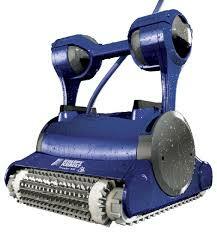 The Prowler 830 Remote Control provides the ultimate in automatic pool cleaning convenience. It's the computer-controlled, programmed cleaner that scrubs and vacuums pools bottom, walls and steps and provides supplemental filtration of pool water. The wireless radio remote control system provides two automatic cleaning options, one for the pool bottom and a second for the bottom and sides. Remote control functions allow for overriding the automatic cleaning modes to perform quick spot clean-ups. Simply guide the cleaner to any area of the pool with the touch of a button. It requires no installation, no booster pump, and no hoses.